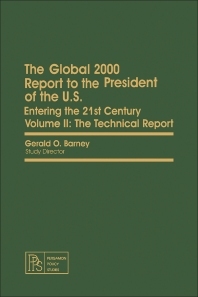 The Global 2000 Report to the President of the U.S. Some of the topics covered in the book are the projections of the population, climate, technology, and the food and agriculture. The analysis of these projections is covered. The tools used in the analysis are discussed. The text defines the meaning of mesarovic-pestel world model, carrying capacity, stability, diversity, and ecological buffering. A comparison of the resulting projections is presented. A chapter of the volume is devoted to the embassy reports on forestry and agricultural trends. Another section of the book focuses on the Latin American world model. The book will provide useful information to economists, political analysts, students and researchers.